Many of us are familiar with the concept of psychological defences; we do certain things or avoid other things to protect ourselves from the things in life that we find challenging and stressful. We are also aware that these defences can eventually become cages for us when they restrict us too much. 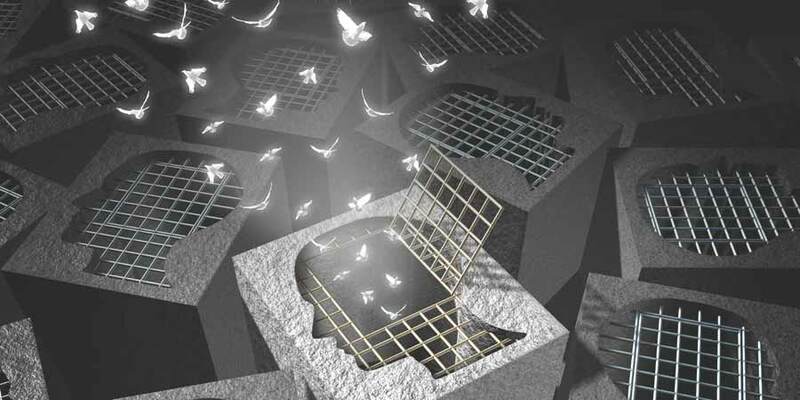 How can we start to break out of these cages of our own making but still keep ourselves safe? All of us have psychological defences and they are necessary to keep us safe. Some are conscious, and some are quite unconscious. These psychological defences can take many forms. They can be a strong reluctance or even refusal on our part to do a certain thing. For instance, if we are concerned about the way we look and how other people see us we might be reluctant to do public speaking or to dance in public. We prefer to avoid these things because of the way they make us feel exposed and thus we strive to maintain our sense of security. In another form, they may come out as certain actions or behaviours that we do. For instance, if we find conflict with other people difficult, we may avoid conflict with other people by being overly nice to them (even when we don't feel this way), or, we may tend to criticise them before they criticise us. In both these cases we strive to keep ourselves psychologically safe through the actions we take. In both of these examples there is a danger that if we continue, these behaviours become habitual and so much of a part of ourselves that we feel unable to change them. Rather than preferring to not do public speaking, we become unable to do public speaking; rather than preferring to be nice to people we become overly compliant towards them. When this happens, our defences become cages. The mistake we make when we try to break out of these cages is to try to change the behaviour directly without understanding what lies underneath it. When we do this, we set ourselves up for failure because we essentially leave ourselves psychologically undefended. It's important to recognise that your defences are often there for good reason – we can be profoundly hurt by the things that other people do and say, even when their motives are good – and people's motives are not always good. Further, living within your defences allows other parts of your personality to develop without constant threat. It is very difficult to flower as a person if you always feel threatened. If we are to change the way that we are, we need to understand ourselves, and how we came to be this way. If it's a matter of psychological defence, then we need to build up our defences in other ways before we let go of the things that keep us protected but limited. The goal of psychotherapy isn't the removal of our defences, but to understand ourselves and to have more flexible responses – and we can only do this when we feel safe. Psychotherapy can help you with your defences as we can explore how you came to be the way you are, and how we can keep you safe during a period of change.